James Ensor, Project for a Chapel Dedicated to Saints Peter and Paul, 1897, Graphite, with brush and brown wash, and lead white gouache, on cream wove paper, 298 x 242 mm , Gift of Dorothy Braude Edinburg to the Harry B. and Bessie K. Braude Memorial Collection, 1998.699, The Art Institute of Chicago. On 14 August 1896, an enormous fire destroys the Saint Peter's Church in Ostend. The roof completely collapses. Only the church walls, the tower, the Baroque portal, the Purgatory and Calvary group and the mausoleum of Queen Louise Marie (wife of the first Belgian King Leopold I), made by the Belgian sculptor Charles Auguste Fraikin (1817-1893), remain intact. The Saint Peter's Church dates to the beginning of the 18th Century when, after a fire in 1712, the old Saint Peter's Church needed to be rebuilt. Between 1764 and 1866, the Calvary and Purgatory group against the North façade of the church was rebuilt thanks to the Fraternity of the Mount of Mercy. After Louise Marie (1812-1850), daughter of the French King Louis-Philippe, dies in Ostend, between 1855 and 1859 a mausoleum is erected. Following an on-site visit by J. Bethune, chief of the Royal Commission for Monuments, and the Belgian architect Louis Delacenserie (1838-1909), it is decided for the provisional preservation of the church tower. In 1912, the city council of Ostend decides to preserve the tower definitively. After that, the tower serves as a belfry. The fisherman's church was close to his heart. He would even like to be buried there after his death. Ensor's grave is still to admire in the small churchyard around the little church of the dunes. Various times he figured in the small church in his work. It shows up likewise in paintings, drawings and prints. The first painted version (Tricot 379) dates from 1896, the year of the fire of the Saint Peter's Church. In 1901, he paints a smaller, yet more colourful version (Tricot 400). 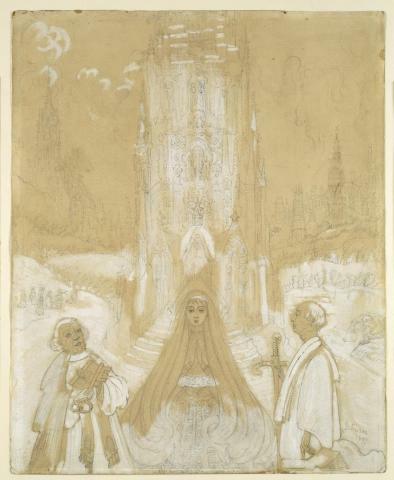 In 1897 he makes his heightened drawing, Project for a Chapel dedicated to Saints Peter and Paul (Art Institute of Chicago). The complete drawing (29,8 x 24,2 mm) is carried out in black pencil and washed ink on light-brown paper, heightened with white gouache. The composition presents an imaginary, Gothic church tower with a praying Madonna in the foreground, flanked by the patron saints of Ostend. On the left we see Saint Peter with a key and a book in each hand and on the right, Saint Paul with a sword in hand. In the background we perceive the silhouette of a pseudo-Medieval city. The style of the work is kin with other works from 1893, amongst which The Execution (Tricot 363) and the drawing entitled, The Virgin Mary with Boats. Both are rendered in miniature in an ‘old-fashioned' style. In The Execution, we see central in the composition, again a pseudo-Gothic tower, similar to the one in Project for a Chapel dedicated to Saints Peter and Paul, in which the composition seems to be inspired by Saint Barbara, a heightened drawing by Jan Van Eyck. Van Eyck places Saint Barbara, with a book on her lap, in the foreground with a Gothic tower behind her. The work of Van Eyck was bequeathed to the City of Antwerp by the former Mayor and Knight Florent van Ertborn (1784-1840). It was publically to be admired after the opening on 11 August 1890 of the new building of the Antwerp museum, the present-day Royal Museum of Fine Arts. James Ensor must have visited the newly built museum shortly after the official opening.